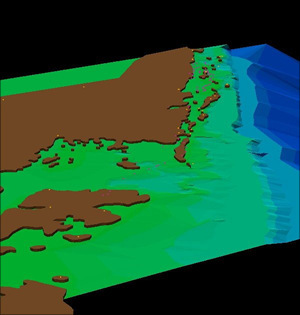 Using topographic maps and bathymetric information from nautical charts, ArcView's 3D Analyst was used to produce 3D representations. 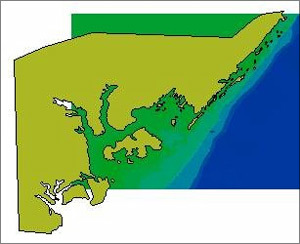 3D visualization of the reserve helps in understanding the dynamics of the fishery. The Kiunga Marine National Reserve, on Kenya's northern coast, protects outstanding mangrove forests, sea grass beds, and coral reefs. Its beaches provide nesting sites for marine turtles, and its sea grass beds provide feeding grounds for the enigmatic dugong. Its offshore rock formations shelter bat roosts and support the world's largest nesting colony of roseate terns, and sharks, rays, whales, and dolphins are found further out to sea. Tidal creeks, limpid lagoons, and towering dunes enrich the landscape. Much of Kenya's coast has experienced rapid human population growth, spiraling demand for marine resources and unplanned development. Unregulated harvesting of fisheries and forests have outstripped rates of natural renewal, while discharges of domestic and industrial waste have overwhelmed the capacities of intertidal wetlands to absorb, dilute, and detoxify effluents. The Kiunga Reserve has survived intact mainly because of its remoteness. Most of the Bajuni people living around the reserve earn their living from fishing. Traditionally they used woven traps to catch reef fish in shallow waters. Mzee Abbas is one of the few remaining practitioners of this technique. "I've always used the uzio and malema traps and can't see the need to change," he says. But most fishermen today use highly effective-and destructive-seine nets, which catch all fish size classes indiscriminately and damage corals and sea grass beds. Larger meshed gill nets are also used-though less damaging to the substrate, they entangle and drown turtles and dugongs. 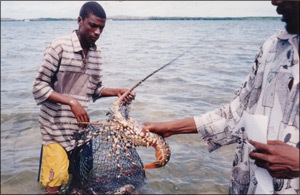 Kiunga's lobster fishery supplies much of Kenya's demand. Large lobsters may attain weights of 6 kg, but concerns are emerging about sustainability. Kiunga's lobster divers use the kimia technique, in which the fisher spears an octopus and ties it to his spear. Lobsters shelter in the reefs in holes with an exit route, so the diver places his hand net over the back door and waves the octopus at the front-the lobster heads for the emergency exit and ends up in the net. Increasingly smaller lobsters are being taken on the reefs. External pressure is intensifying in Kiunga. Sixty percent of users come from outside the reserve, and there is growing demand from commercial outfits interested in "mining" the fishery. Habitat damage and declining catches already are apparent. Left unchecked, they will diminish the biological value of the reserve and impoverish the people most dependent on it. WWF-trained community monitors have been collecting data on fish and lobster harvests since 1998, but financial constraints hampered the project's ability to use the accumulated data. Now a Microsoft Access database is being developed to manage the data. This provides the flexible automated analyses to explore the key issues of concern. 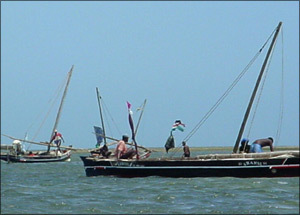 Today most fishermen in Kiunga operate using unmotorized sailboats or dhows. Having had previous experience with the applicability of ArcView and its extensions to natural resources management and protected area planning, the Kiunga Reserve and the WWF selected ArcView to augment the fisheries database. The GIS role is to communicate outputs from the fisheries database. Connectivity between ArcView and Access is therefore an important asset, simplifying the process of linking spatial features and related attribute data. The level of use is very simple-with everything on one PC, the WWF Kiunga relies on ArcView SQL Connect and database table linking/joining to access fisheries data in the database. WWF Kiunga has used ArcView Image Analysis to manipulate and georectify graphical background themes and employed ArcView 3D Analyst to create and view TINs that provide a conceptual three-dimensional representation of the fishery. Themes include the basic outlines of coastal and island landforms, key locations and fishing grounds, and tracks and seafloor contours. Data was sourced from topographical maps, nautical charts, scanned graphics, and GPS. In addition, the ArcView Spatial Analyst extension includes the necessary tools to help investigate the relationship between physical features and aspects of species ecology and fishery production. Together, these extensions ease the process of incorporating and manipulating remotely sensed raster data such as aerial and satellite imagery. Any fisheries data analyses with a spatial element (e.g., catch per fishing ground, relations between habitat health and gear use) can be linked to the GIS. This is helpful for presentations at fisheries management meetings-displaying such relationships on maps makes them more explicit. For all audiences, it helps if the results can be fit to a mental map-the "yes, but where is it?!" factor-that satisfactorily clarifies the issues. The process of development of resource maps is an excellent way of involving local fishers in planning resource use. GPS work provides ground control points with which WWF Kiunga can refine and classify landscape themes and complete data on fishing grounds, or imbos. From May through September the southeast monsoon makes offshore conditions too rough for small craft, so WWF Kiunga concentrated on mapping imbos lying within the reefs. These were sheltered from the open sea but still experienced tumultuous surf-quite a distraction to survey work for those more used to dry land! Back on terra firma, GPS data is downloaded via Garmin's MapSource program and then converted to point shapefiles with ArcView software's AddEventTheme protocol. The GIS will permit increasingly revealing spatial analyses of the ecology of the reserve. Obvious options are habitat associations, occurrence maps, and ranging models for species of concern (using ArcView Spatial Analyst), detailed maps of sensitive sites, sampling sites, and habitats under restoration. The GIS could also be used to undertake change assessments of the productivity of fishing grounds, coral reefs, recovering habitats, and nesting beaches. For more information, contact Julie Church, project executant, WWF Kiunga Project (e-mail: julie.church@eikmail.com), or Simon Jennings, Sungura Consultants (e-mail: jennings@info.bw or sisim4semo@hotmail.com). Simon Jennings gratefully acknowledges assistance in support of conservation work from Geographic Information Management Systems (GIMS) of South Africa, via Ingrid Landman.